The Battle of Normandy was fought in 1944 between the German forces occupying Western Europe and the invading Allied forces as part of the larger conflict of World War II. Sixty years later, the Normandy invasion, codenamed Operation OVERLORD, remains the largest seaborne invasion in history, involving almost three million troops crossing the English Channel from England to Normandy in then German-occupied France. The main Allied forces came from the United States, United Kingdom and Canada, but a total of twelve nations contributed units, the rest being Australia, Belgium, Czechoslovakia, France, Greece, the Netherlands, New Zealand, Norway and Poland. The Normandy invasion began with overnight airborne paratrooper and glider landings, massive air and naval bombardments, and an early morning amphibious assault on June 6, "D-day". The battle for Normandy continued for more than two months, with campaigns to establish, expand, and eventually break out of the Allied beachheads. It concluded with the liberation of Paris and the fall of the Chambois pocket. 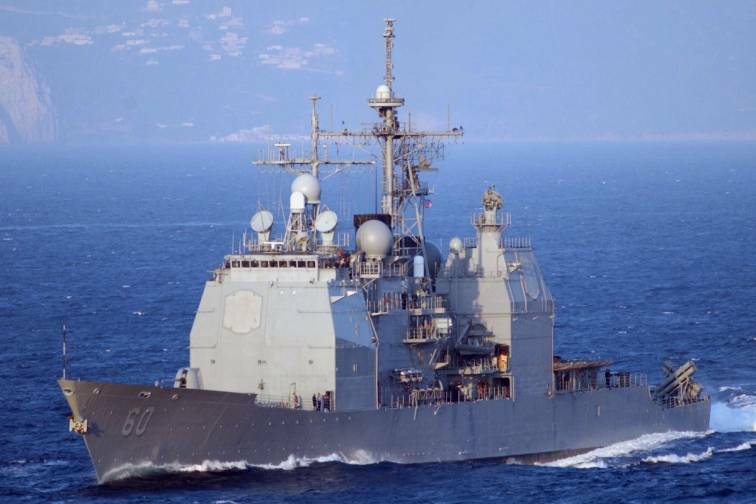 Normandy (CG-60) was laid down 7 April 1987 by Bath Iron Works, Bath, Maine; launched 19 March 1988; commissioned 9 December 1989. 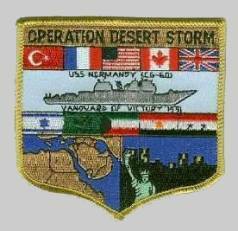 Normandy and her crew left on 28 December 1990 to join United Nations forces conducting Operations Desert Shield and Desert Storm. As part of the America (CV-66) carrier battle group, Normandy transited the Suez Canal and the Red Sea on her way to the Arabian Gulf. Normandy fired 26 Tomahawk cruise missiles, protected allied ships and aircraft in the area, conducted maritime interdiction operations, and helped to locate and destroy enemy mines. Normandy received the Navy Unit Commendation, the National Defense Service Medal, and the Southwest Asia Campaign Medal (with two bronze stars) for her efforts in support of Operations Desert Shield and Desert Storm. 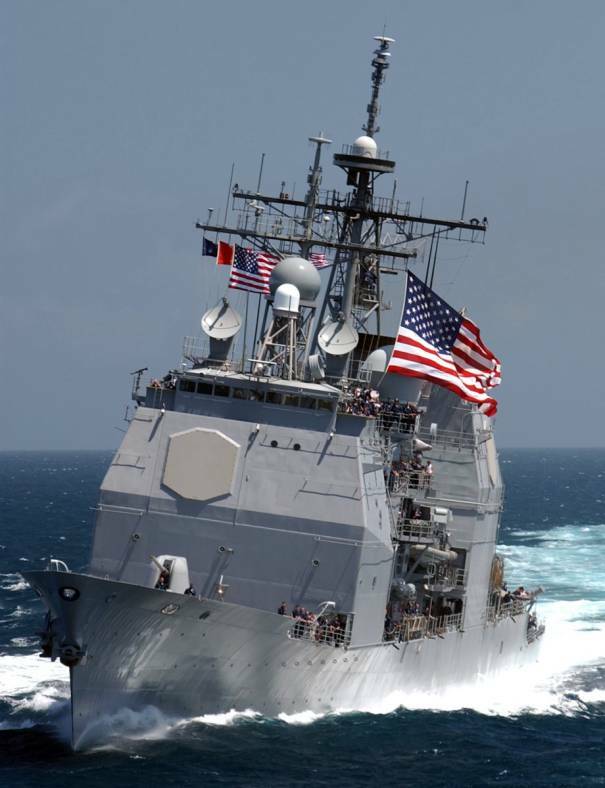 On 11 August 1993, Normandy and America CVBG deployed to the Adriatic Sea in support of United Nations efforts with the Former Republic of Yugoslavia. Normandy's primary duty was Adriatic air-space controller for Operations Provide Promise, Deny Flight, and Sharp Guard. In a historic first, Normandy embarked nine World War II veterans on 18 May 1994 for commemoration of the 50th anniversary of the Allied landings on the coast of France. These activities took place in Portsmouth, United Kingdom, and Le Havre, France. Over 15,000 visitors toured the ship while Normandy's honor guard embarked veterans participated in various memorial services and events on both sides of the English Channel. Normandy served as a centerpiece over the two week course of ceremonies, and specifically for national commemorations at Slapton Sands, United Kingdom on 31 May by U.S. Ambassador Crowe, and at the Normandy beach heads on 6 June by President Clinton. Normandy received the Navy Unit Commendation Medal in June for participation in the D-Day festivities. 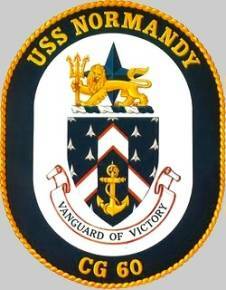 On June 27, 1994, Normandy participated in the Naval Station, New York closing ceremonies. Staten Island's mayor, Guy Molinari, and his daughter Congresswoman Susan Molinari were the featured speakers as the Navy turned the base over to the city's Emergency Services prior to departing for their new homeport in Norfolk, VA. Normandy was stationed in Staten Island, New York for almost four years. 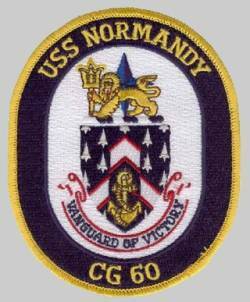 On August 28, 1995, Normandy began a six month deployment to the Mediterranean Sea with the America (CV-66). On 8 September, Normandy was in the Western Mediterranean conducting turnover with the outgoing Battlegroup. Receiving immediate tasking to proceed at best speed to the Adriatic, Normandy sped across the 1600 Nautical miles at maximum speed. Arriving in the Operation Deliberate Force Theater of Operations in just under 48 hours, Normandy launched a thirteen missile Tomahawk strike against hostile air defense command and control sites in Northern Bosnia-Herzegovina. This precision strike, flawlessly executed on extreme short notice, paved the way for follow-on tactical air strikes against Bosnian Serb Military positions in the region. This action sent a strong signal of United States resolve and played a significant role in convincing the Bosnian-Serb government to cease hostilities and resume peace negotiations. During the six month deployment Normandy again served as Adriatic air-space controller for Operations Deny Flight, Sharp Guard, and Decisive Endeavor. Normandy was awarded her third Navy Unit Commendation and the Meritorious Unit Commendation for her actions during her time in the Adriatic. 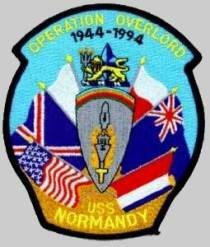 On 3 October 1997, Normandy once again began a six month deployment. This time, as Air Defense Commander of the George Washington (CVN-73) Battlegroup. Throughout the month of October, Normandy participated, along with 27 other international units, in Exercise Bright Star off the Egyptian coast. Upon completion of Bright Star, Normandy was directed to proceed at best speed to the Arabian Gulf. Beginning November 16th, Normandy, along with other units of the George Washington Battlegroup, transited the Suez Canal, Red Sea, Gulf of Oman, and Arabian Sea. In a record-setting five days, Normandy and George Washington entered the Arabian Gulf and joined the Nimitz Battlegroup in an impressive show of force and United Nation resolve with Iraq. 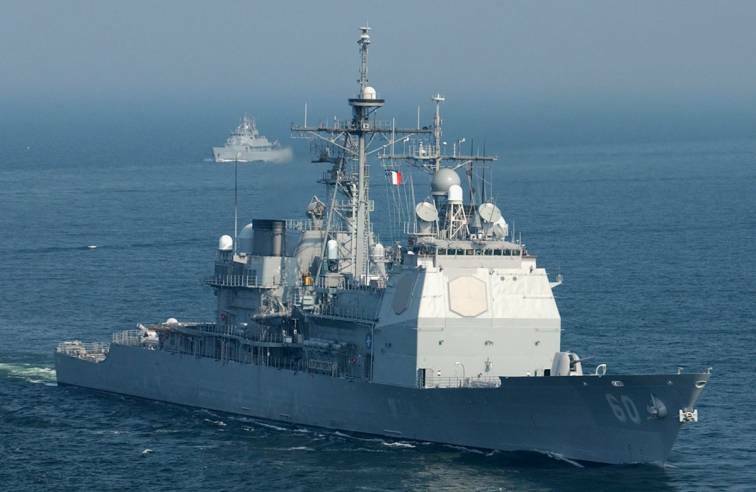 Immediately, Normandy assumed the duties as the "Ready Strike" platform in the Gulf and, later, also assumed the duties as the air-defense commander for the entire Arabian Gulf. 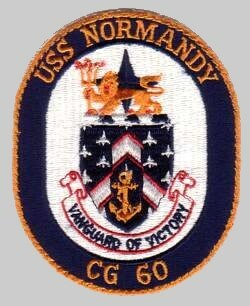 For four months Normandy patrolled the Gulf in support of Operation Southern Watch. During this time, she conducted several successful maritime-interception operations along with her strike and air-defense duties. 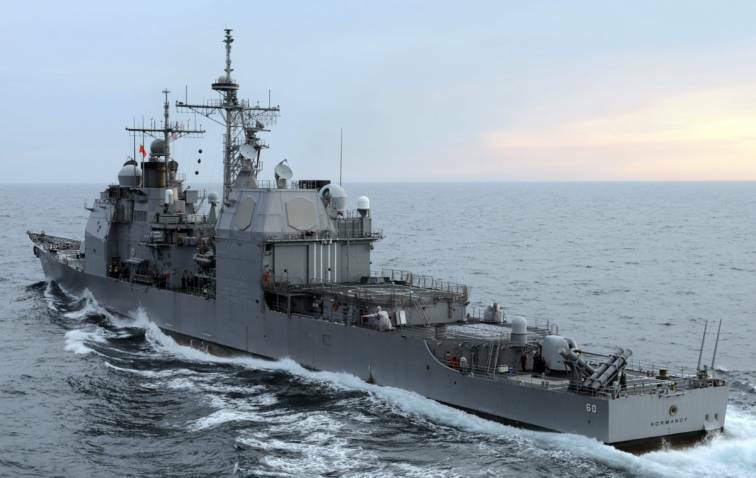 Throughout her most recent deployment, Normandy achieved more than 300 mishap free hours of flight operations, conducted 27 underway replenishments, prepared 720 meals for her crew, and sailed a total of 48,000 miles. Underway for the holidays Normandy hosted pop singer Paula Cole on the 23rd of December and the Chief of Naval Operations, Adm Jay Johnson, along with his wife and the Master Chief Petty Officer of the Navy, ETCM John Hagan, on Christmas morning. 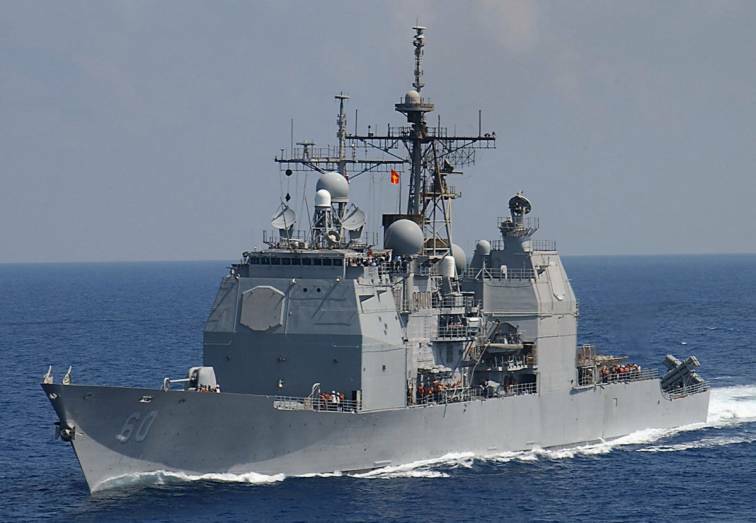 Normandy was relieved by the John C. Stennis Battlegroup in and returned to her homeport in Norfolk on 3 April 1998. Normandy then underwent a major overhaul period in Norfolk Naval Shipyard. 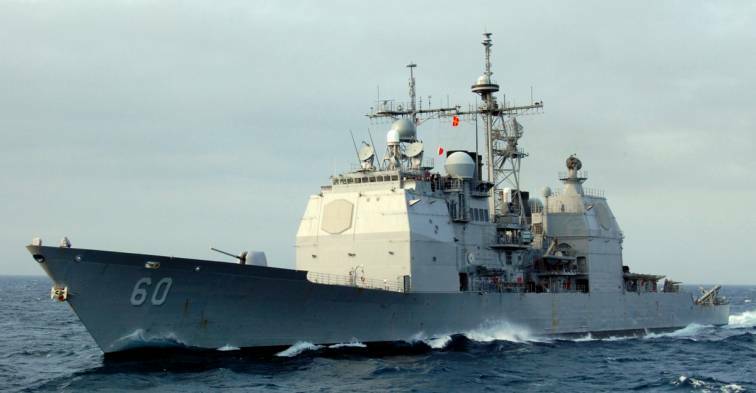 As of mid-1998, along with the title "Most Tomahawks shot by a U.S. Navy Cruiser", Normandy (CG-60) held three Battle "E" Awards for overall ship-wide excellence in performance. 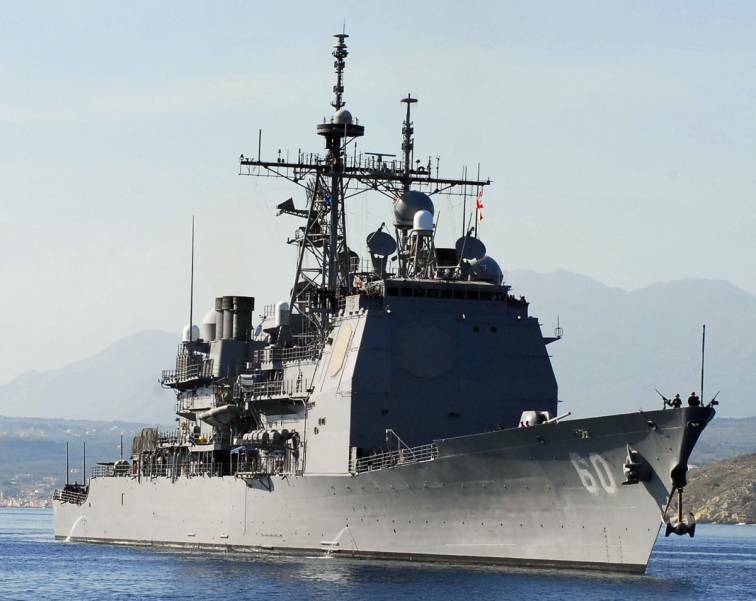 She is the first U.S. warship since 1945 to go to war on her maiden cruise. 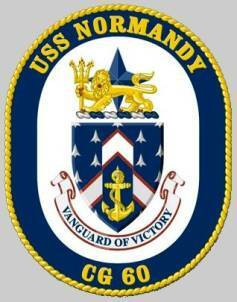 The Normandy deployed with the Washington Battle Group in February 2000 for a scheduled six months deployement. 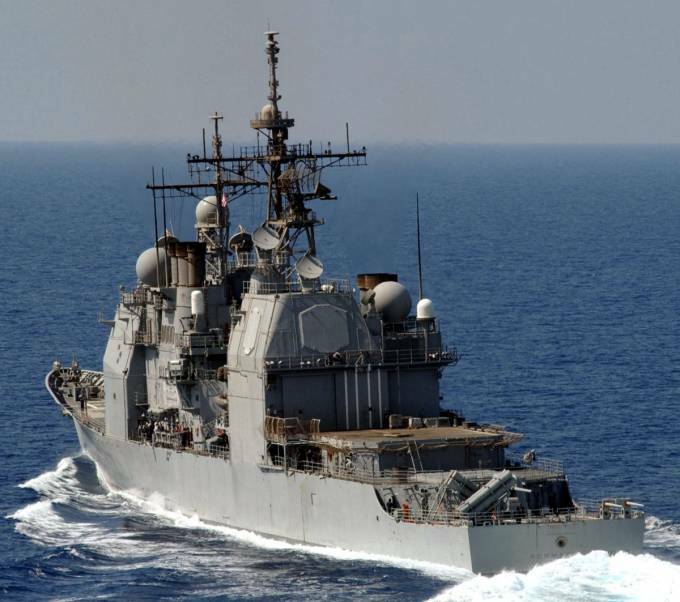 In March 2000, with the USS Washington Battle Group, it took part in a Composite Training Exercise (COMTUEX). 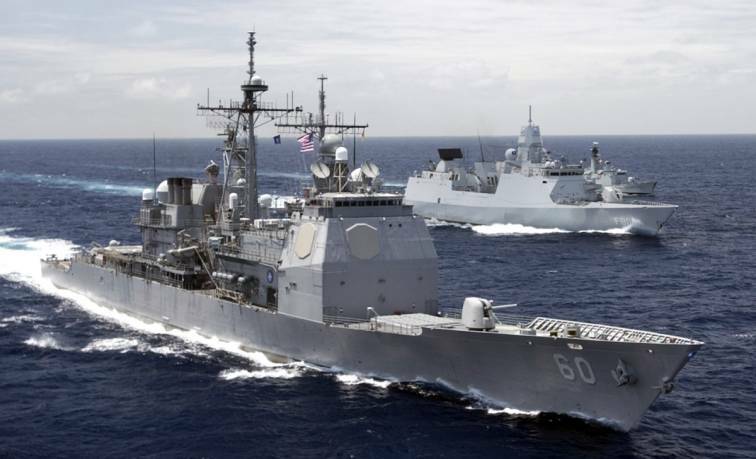 The Normandy took part in a Joint Task Force Exercise in the Atlantic Ocean in May 2000. 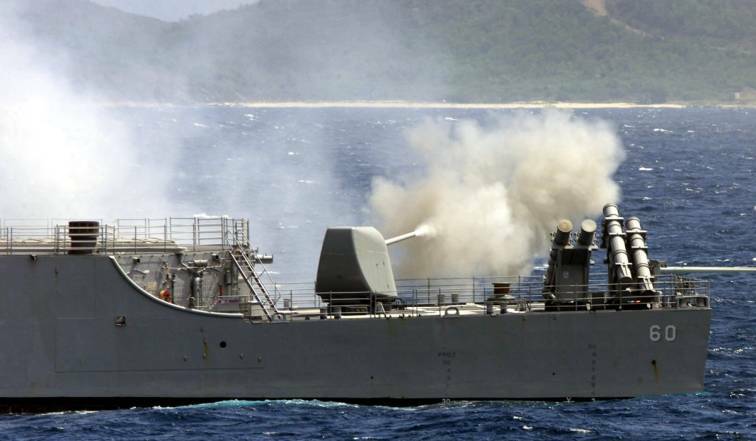 It took part in firing trainig on the training range on Vieques, Puerto Rico, in June 2000. 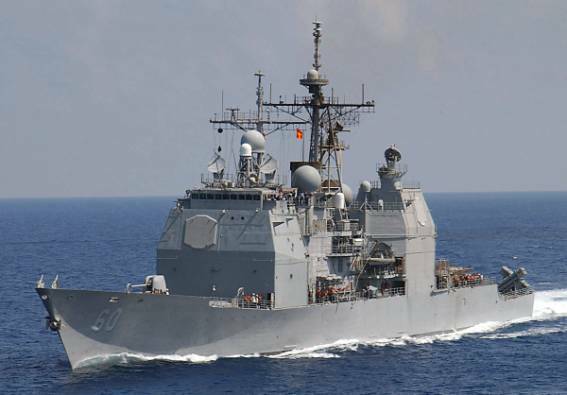 It Transited through the Suez Canal enroute to the Red Sea in mid-July. Ships and aircraft of the George Washington (CVN-73) Carrier Battle Group commenced use of the Vieques Island inner range in conjunction with their Composite Unit Training Exercise (COMPTUEX). 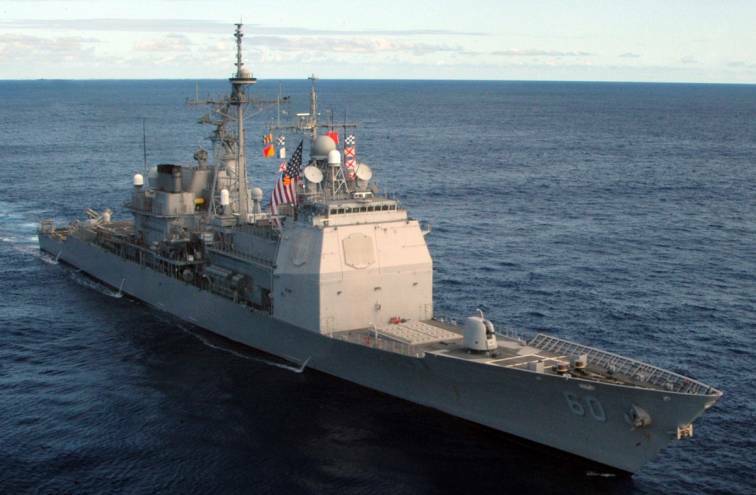 The exercise, which began April 1, 2002, also utilized the Northern and Southern Puerto Rican Operating Areas and involved complex battle group training events, naval surface fire support training and air-to-ground bombing. COMPTUEX is an intermediate level battle group exercise designed to forge the Battle Group into a cohesive, fighting team.